A cartoon blog - strawberry dragons: 1994 Cornwall - anyone for tennis? 1994 Cornwall - anyone for tennis? 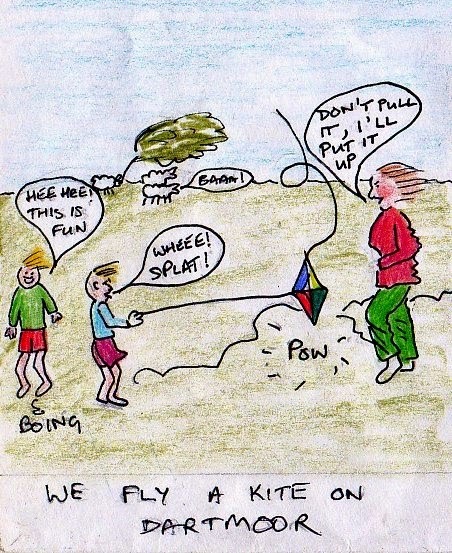 We never had much luck with kites. I always think that Charlie Brown's kite eating tree is real and has extended its hold to all of the natural world. The ground eats kites, so do bushes, dogs, sheep, other people and sometimes other kites. They have to be strong to be flown at all, because they hit the ground so very fast. Still, the boys loved going kite flying, partly because they loved to see a really good kite smash! It was really windy that day. The kite did not make it home. Once we had a lovely little booklet with patterns for kites. We made them all with the tissue paper and straws that came with the booklet. I think they needed a specially moderate wind tunnel to fly in, with strict speed control on the wind. They certainly couldn't manage to stay together in a gentle breeze. We did try blowing them up in the air at home with the fan heater, but they still disintegrated and fell like little moths. I can't understand how Mr Banks in Mary Poppins did it. Maybe he should make a video? Jim's Mum had a bad angina attack in the night. The doctor was really cute and helpful. Yes he did make this joke. 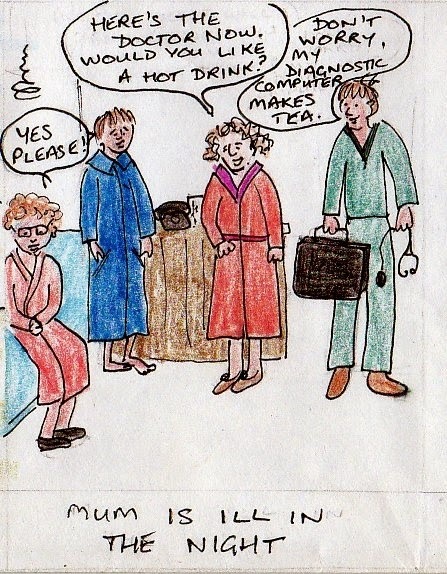 The lady from the hotel was also lovely and we all went back to bed at about 4 am with a mug of horlicks (malted milk). When we were woken at the usual time by Clara and the boys champing at the bit for their breakfast, we certainly didn't want to rise and shine, but we were terribly impressed when we stumbled from our room and shambled into breakfast. The lady who made us the horlicks was there on duty, bright eyed and bushy tailed despite having only had 3 hours sleep. That's what I call fortitude! Sleep deprivation is no stranger to most parents. I was horrified to find that I was expected to function whilst hallucinating from lack of sleep when I first had Sam. It was so different from the calm and orderly world of the office, where tea breaks and lunch were interspersed with periods of concentrated effort and productive work. I can remember feeling proud if I got dressed before Jim came home. . .
Jim's mum was not an active person, as I may have mentioned, but she was a pretty competent table tennis player. I was not. I have never been any good at ball games. I can manage badminton because the shuttlecock moves slowly some of the time so I can leap into place and swipe at it. Even so I could not return fast shots or hit anything at all with any degree of certainty. A few years ago, Jim and I used to go out and play ordinary tennis. We stopped when we noticed that other much older people were so much better than us and that they could return balls over the net. The best time was when we found a tennis court on one of our holidays, in the field behind our cottage. We had fun hitting the balls at each other and one day we even managed a rally! How cool is that? After two weeks we were almost good enough to play in public, but winter came and we lost our nerve. Back to tea and cake instead!